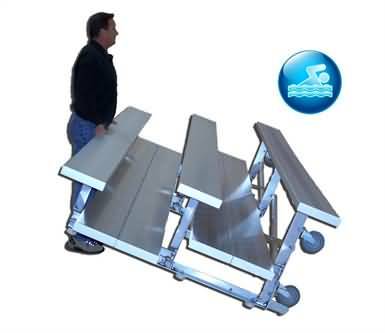 Check out these pool side bleachers, they are great for any indoor area with a pool. The extra anodization and stainless steel hardware will protect them from the water. For Instant Product & Shipping Quotes Emailed To You Click button below, click here to learn more. For detailed product information Click the model number below. 2-Rows -7.5'Long -Seats 10 -Weight -121lbs. 2-Rows -9'Long -Seats 12 -Weight -128lbs. 2-Rows -12'Long -Seats 16 -Weight -157lbs. 2-Rows -15'Long -Seats 20 -Weight -199lbs. 2-Rows -21'Long -Seats 28 -Weight -245lbs. 2-Rows -24'Long -Seats 32 -Weight -276lbs. 3-Rows -7.5'Long -Seats 15 -Weight -160lbs. 3-Rows -9'Long -Seats 18 -Weight -173lbs. 3-Rows -12'Long -Seats 24 -Weight -219lbs. 3-Rows -15'Long -Seats 30 -Weight -271lbs. 3-Rows -21'Long -Seats 42 -Weight -343lbs. 3-Rows -24'Long -Seats 48 -Weight -392lbs. 2-Rows -7.5'Long -Seats 10 -Weight -135lbs. 2-Rows -9'Long -Seats 12 -Weight -145lbs. 2-Rows -12'Long -Seats 16 -Weight -179lbs. 2-Rows -15'Long -Seats 20 -Weight -226lbs. 2-Rows -21'Long -Seats 28 -Weight -282lbs. 2-Rows -24'Long -Seats 32 -Weight -320lbs. 3-Rows -7.5'Long -Seats 15 -Weight -188lbs. 3-Rows -9'Long -Seats 18 -Weight -206lbs. 3-Rows -12'Long -Seats 24 -Weight -263lbs. 3-Rows -15'Long -Seats 30 -Weight -325lbs. 3-Rows -21'Long -Seats 42 -Weight -419lbs. 3-Rows -24'Long -Seats 48 -Weight -479lbs.